When you're shopping for a new vehicle, what features are most important to you? Is it style, comfort, or technology. If you want it all, you're in luck! 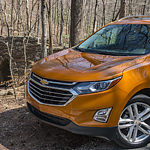 The new Chevrolet Equinox is a highly sought-after compact SUV. The driver's seat is engineered to enhance your comfort and driving experience. We here at Gillman Chevrolet Buick GMC are proud to show you how the Equinox can change the way you drive. The SUV has a unique dual-cockpit design. Everything is within reach so that you can stay in control as you drive. The integrated center stack features an intuitive infotainment center. You can use the system to get directions, control your music, make hands-free calls, and more. In front of the driver's seat is the available digital display. It complements the traditional analog gauges by providing you with detailed performance metrics at a glance. The screen can be customized to meet your ever-changing needs.